"This is a sure winner tomato salsa recipe." Preheat oven's broiler and set the oven rack about 6 inches from the heat source. Line a large baking sheet with aluminum foil. Arrange the tomatoes, onion, and jalapeno pepper on the prepared baking sheet. Roast the vegetables under the broiler until the skins are blackened, about 10 minutes. Combine the roasted vegetables, garlic, cilantro, lime juice, salt, and chipotle peppers in a blender; blend to desired consistency. Store unused portions in refrigerator up to 1 week. See Chef Juan’s secret recipe for Cinco de Mayo-worthy homemade salsa cruda. 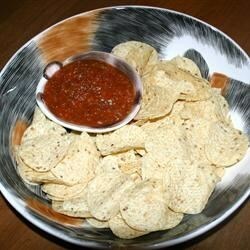 This is an easy, adaptable recipe that turns out a tasty salsa. Thanks, Elaine. This one's a keeper! This was fairly fast and pretty good, but too salty! I used iodized sea salt, so not sure if that made a difference. Made it without roasting anything & it still turned out very good!